At the end of the 19 th century the excursion traffic to Zittau mountains increases, so for a better traffictieing was looked. In 1884 there was founded a comittee which had the idea of building a narrow gauge railway to Zittau moutains. As a result there was founded the "Zittau-Oybin-Jonsdorfer Eisenbahngesellschaft" ( ZOJE ), which took care of the financial part of railway building. Now starting of building the railway was secured. At November 24 th, 1890 the opening train goes from Zittau to Jonsdorf and than to Oybin. On December 15 th, 1890 after some delays, the regular traffic was done. On this picture you can see two carriages, which are now owned by the club "Interessenverband Zittauer Schmalspurbahnen e.V." At the beginning, the narrow gauge railway was running engines of saxonian kind I K , 2- axle personal carriages and some goods waggon. On July 1st, 1906 the till this moment private ZOJE was incorporated to the "Königlich Sächsische Staatseisenbahn". The excursion traffic to the Zittau mountains increases more during this times, so in the year 1909 the engagement of more powerful engines of saxonian kind IV K was started. Some of these machines were running till the 1960s at our narrow gauge railway. The engine IV K 99 555 is owned by our club. At times also machines of type VI K were operating till the 1950s. 1928 the buying of engines from type 99 73 - 76 ( 1'E1' Einheitslok ) started. These engines are seen till now on the "Zittau Narrow Gauge Railway". Also the carriage-park got increased. Narrow-gauge goods waggons were only a few in operation, the goods traffic mostly was done with regular gauge goods waggons on special rolling carriages. For travelling there were some interesting carriages of different types in operation, for example an open person-carriage which was under good popularity. Today the 4-axle reconstructed - and uniform waggons in moderniced art are forming the picture of the railway. In 1938 motor -coaches Type VT 137 322 - 325 were bought. The remaining motor coach (137 322) took his job till 1964 and is now, in case of a defect, in rolling ability in the engine shed of "Bahnhof Bertsdorf". In 1963 a very interesting engine came to the "Zittauer Schmalspurbahn". Engine 99 4532 ( Building year 1924 ) came from the " Trusetalbahn " in thuringia and was used as shunting engine in Zittau. Today this engine is owned by the club and located at the engine shed of "Bahnhof Bertsdorf". At especially causes this vehicle is presented to the public. Causing the increase of excursion traffic, in 1913 the line from "Zittau-Vorstadt" to "Oybin" was built for two way traffic. The train-following increases too, so that for some time there were express-trains which did not stop at any station. Between 1943 and 1945 this second track was removed step by step . Till today the mechanical key-signal-box at "Bahnhof Bertsdorf" is in operation. At this place the responsible person for the track "Zittau-Oybin-Jonsdorf" is doing his job . This signal-tower , built in 1938 , is one of the few "High Signal Box" at an saxonian narrow gauge railway. Causing the enlargement of the brown coal mine Olbersdorf the end of the railway was a sealed thing. On May 27 th, 1990 the excursion traffic and short time later the goods traffic should be closed. A substitute solution in form of a tram was prepared. All railway fans now are glad, that this does not happen causing the turn in political order. Today the brown coal mine Olbersdorf is closed. There is now a lake with a nearby recovering area and the exhibition area of our 'AG Grubenbahn'. Till now, the railway steams to the Zittau mountains, but under difficult conditions. In 1992 the goods traffic closes in case of decreasing freight goods. Also the personal traffic decreases during the 90s , but the road traffic to the Zittau mountains increases very strong. The "Deutsche Bahn AG" early had declared, that in 1998 the narrow gauge railway will be shut down, causing the very high defizit in millions for operation. 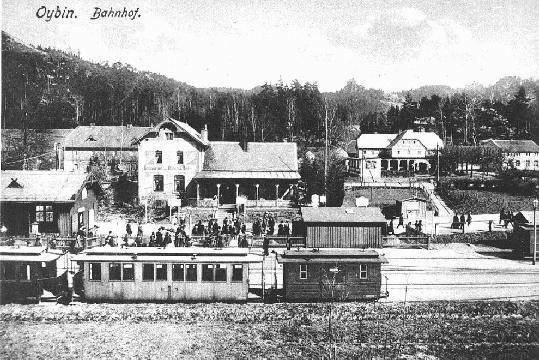 Suggested by the activities of the 'Interessenverband' for preservation of the narrow gauge railway, in 1994 the 'Sächsisch Oberlausitzer Eisenbahn Gesellschaft' ( SOEG ) was founded . Partner of this society are at this time the county of Löbau - Zittau , the town Zittau and the communities Olbersdorf , Bertsdorf-Hörnitz, Oybin and Jonsdorf. After long pre-works at December 12th, 1996 the management solemn was given to the SOEG. In 2003/2004 the SOEG rebuild the track between Zittau Station and Zittau Suburb. The goal was the simplify of the railway processes. In Bertsdorf it was a track reconstruction in autim/winter 2005 too. 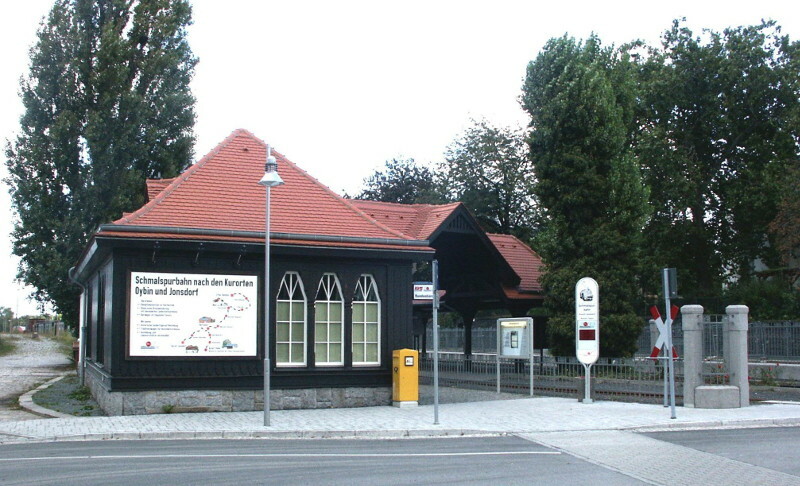 In 2007 was build the new carriages repair station in Zittaus. The reconstruction of the goods shed in Jonsdorf and the water house was reconstructed too. In Ziitta near the carriages repair station the SOEG build a big wagon shed for better preservation of the trains. On the following pages you will find the most important things during the live of our railway in tabled order. Explanations in details you can find in our Brochures to history of the ZOJE. July 1st, 1906 Taking over of 'ZOJE' by 'Königlich Sächsische Staatseisenbahn' (K.Sächs.Sts.E.B). New 4-axle waggons and engines of type IV K were procured. 1912 Attempting of coupling two type IK engines back to back to type II K new. Depending to this bigger engines the locomotive-housing in station Bertsdorf was enlarged. April 15th, 1913 Starting of building the two- way track between 'Zittau-Vorstadt' and 'Oybin?'. During this work there were built some station buildings as substitute to waiting-halls. 1924 The 'Sächsische Staatseisenbahn' (Sächs.St.E.B.) is incorporated in 'Deutsche Reichsbahn'. More engines of type IV K were bought. January 26th, 1926 The accident at 'Olbersdorf-Oberdorf' (Kohlenviebig) took place. Autumn 1927 Basic transport improvement of regular gauge wagons from rolling-bucks to new bought rolling-wagons. 1928 Abolishment of 4th class with normal wooden seats; this is now the 3rd class. Some more passenger carriages and more powerful engines of type VII K were bought. May 15th, 1932 First passenger train with electric lighting. July 2nd, 1934 First passenger train with steam heating. 1936 Procuring of the first utility passenger carriages with accomplished packing wagon. The wagons were still endowed with funnel-connectors. 1938 The first diesel-engine coaches in double traction were on the track. 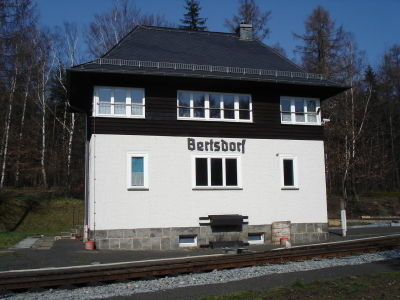 In station Bertsdorf the signal tower was built. 1943 to 1945 The second track between 'Zittau-Vorstadt' and 'Oybin' was removed. 1955 to 1957 A motor coach, made from Lithuanian 'old pieces' had a guest play at the Zittau narrow gauge railway. 1960 ... ? All not used tracks were removed from 'Deutsche Reichsbahn'. 1962 The usability test with disel engines 36 4801 und 36 4802. 1964 Parking of the remaining motor coach in station Bertsdorf in case of gear- and / or motor-defect. 1969 The 'Deutsche Reichsbahn' stops the goods-traffic from Olbersdorf - Oberdorf to the mountain - communities. 1970 The person - carriages got reconstructed and were metal - lined. The seats are changed to hard - pad material. July 6th, 1990 Establishing of the 'Interessenverband Zittauer Schmalspurbahnen e.V.'. 1992 ...1993 Reorganisation of engines to light- oil firing and nearly all wagons from vacuum- brake to pressure-air brake. 1994 Establishing of 'Sächsisch Oberlausitzer Eisenbahn Gesellschaft (SOEG)'. December 1st, 1996 Handing over of operation from 'Deutsche Bahn AG' (DB AG) to the SOEG. October 10th, 2001 The main-building at Bertsdorf-station gets property of the 'Interessenverband Zittauer Schmalspurbahnen e. V.'. 23.02.-08.04.2004 Reconstructions and changes of the track between Zittau Station and Zittau Suburb. 08.10.2004 Destroy of the old change hall and the post office building in Zittau. Autim/Winter 2005 Reconstruction of all tracks in Bertsdorf station. 2007 Found the new building for carriages repair. The good shed in Jonsdorf and the water house are reconstructed. 2012 For better train crossing now the Olbersdorf Upper Village get fallback swichtes.